Android 4.4 update may be closer than we think, but Google is trying hard to keep everything a secret. 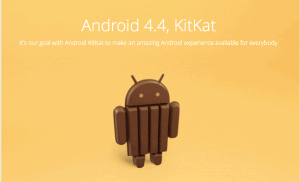 However website AusDroid.net says they have received a tip indicating that Android 4.4 KitKat will be launched on October 14. First of all, Android 4.4 is expected to be available for older models also. This means we could see a Nexus S or a Galaxy Ace 2 updated to Android 4.4. The tipster also indicated fragmentation changes, Miracast updates, a new visualization mode in the stock Gallery app, a new range of colors in the default Android theme and new notification widgets. Of course, the thing we are all expecting to be true is the older model availability. If Google really manages to push the Android 4.4 update on most of its devices it will be a first in its history. We all know how manufacturers and carriers slow the update procedures in a way that when a new Android version is released older model are only getting updated to the previous one. Android 4.4 was already officially presented by Google, as they have started an official webpage dedicated to this version in which all the versions are presented with their story from the first version of Android up until 4.4. This can be a strong indicator that Google wants to release Android 4.4 as soon as possible, and this can mean October 14th is the date.